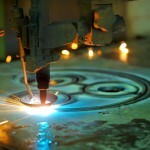 Thermal cutting applications, such as plasma and laser cutting, generate considerable levels of fume and particulate that can be detrimental to cutting machinery and may present health risks to employees. Uncontrolled thermal cutting fumes result in reduced worker productivity, product quality problems, factory maintenance issues and environmental concerns. Air Purification Inc. offers a full line of fume extraction and collection equipment for the safe control of thermally generated fumes from laser cutting and plasma cutting. We offer dust collectors that have ducting to the cutting operation, which can reduce worker exposure to fume and protect valuable machinery.